What would a European Cultural Commons be? Last week’s, um, Uxford Onion debate at the Europeana plenary in Leuven (all presentations here), on the proposition above, was stimulating and useful but left most of us still scratching our heads about just what it is. I’d been fortunate to take part in a break-out session the day before where Louise Edwards gave us some background on the idea of a cultural commons and we heard about two case studies showing different facets of the idea. Louise then did another version for the whole conference before the debate. I’ve snipped a little from my notes at the end of this post but I can't do it justive. Look at Louise's presentation here (PDF), or else go to the source and read the work of the late Elinor Ostrom and of Charlotte Hess and extrapolate from there (I must also do this myself). I must admit I was still pretty unclear how the general idea was meant to translate into an actual thing, and I wasn’t the only one, but it was a very stimulating idea nonetheless and an excellent debate too, spearheaded by Tony Ageh and Nick Poole (for and against) and seconded by Gary Hall and Susan Hazan, respectively, with input from the floor too (and chaired by the one and only Jill Cousins to strict Uxford Onion rules). To me, the question appeared moot because it seemed that a fundamental of a commons is that it is free to all – certainly within the identified community, although perhaps in some cases amongst anyone who happens to stumble across the resource in question. But still, it does beg the question of what was required of the Commons or of something that was “in” it. It also threw up many possibilities as to what “free” might mean; whether some sorts of “freedom” might look like restrictions from some perspectives; and whether all dimensions of “free” would be required in order for something to pass muster as part of a commonly-held good. One respondent from the floor argued forcefully that GLAMs should not have to allow people to do what they liked with their material, because they were the authoritative source. My immediate reaction was, well, then it doesn’t belong in the commons (also: get a grip). It seemed to me that we could thereby end up with two cultural commons: one the actual culture that people live in day to day (arguably myriad cultures, actually), replete as it is with restrictions both legal and normative but essentially an organically growing thing in which ideas are transmitted, mutated, opposed and which is actually in all but limited circumstances very free (if you think about the number of ideas, memes, fashions, habits etc that get passed around they far outweigh those encumbered by patents, copyright etc); the other a Commons with a C, in which authorised voices in a partitioned corner of that approved “culture” get to control what is said about various ideas, things etc. This is neither common nor cultural (that is, passed between members of a society and evolving along the way), and it would probably be counterproductive, putting a barrier between GLAMs and unauthorised participants by treating the latter as second-class members of the “culture”. OK, that’s how stuff often happens now, and it’s not necessarily illegitimate, but it is nothing to do with the idea of a commons in which participants develop ways to look after a shared resource responsibly. Well after my initial reaction to that speaker making the case for museum authority in a commons, I did reflect further. In his closing remarks Nick Poole almost had me voting for the “opposition” by arguing persuasively for the sustainability of a commons to be remembered (I think he may have been arguing against his beliefs but god, he’s a fine debater!) It reminded me that for a commons to succeed it is very likely to have restrictions. According to Ostrom’s model they will be set by the community (perhaps they will even end up ossified into law), complete with sanctions and means for these to be applied, and everyone in the community can participate in rule-making. So is a restriction that requires, for example, the respectful use of an image or reasonable attribution of a source necessarily incompatible with a commonly-held good? Would, say, a requirement to give attribution (a BY clause) stop something being “free” and be incompatible with a commons? Perhaps not. A commons is about shared responsibility, so if an organisation contributes something to the commons it gives up the right to dictate the correct use of the item, but the community may still demand respectful use. As we said above, a code of behaviour and system for establishing breaches and applying sanctions are part of a commons too, and rules around respectful behaviour could help to make a cultural commons sustainable, not least by giving museums the confidence to add more material. Free-riders – for example, those that make offensive use of commonly-held media – would need to be identifiable and open to sanction by the community, and perhaps one could/would still need to depend upon legal means (licences etc) for this. This is not the same by any means as a museum being able to impose its own limitations on the use of things it had contributed to the commons. Perhaps the deal with the commons, then, is not that restrictions upon totally libre use of an item are absent, but that the contributor must place its trust in the community (if it accepts the item), which will then assume responsibility for setting any restrictions and applying any sanctions. Once it is part of the commons, though, a contributor must accept that it has lost exclusive control and becomes one voice amongst many. By participating as a persuasive member of a commons, a museum might have a stronger voice, but ownership is gone – that just ain’t a commons, and it ain’t culture either. I wonder if this extends to the other kind of free: does something not being gratis-free stop it also being free-as-a-bird free? Well it does limit freedom, in that it prevents use by certain parties that are unable to pay; but if it is what the community deems necessary for the commonwealth to be sustainable, perhaps again it’s not actually incompatible with a commons after all. I surprise myself. Yeah, but still, wtf is it? So back to the question: what concrete form might a European Cultural Commons take, and what would that mean someone would actually do in order to add material to it, and what role might Europeana play, if any? Some ideas. It might be as simple as a public domain dedication of the sort that already exists. Perhaps it could be branded in some new fashion, if there was some political or stakeholder rationale for that, but it would basically be nothing new. It might be a place where items badged like this are held, or where an index of them is held. Again, things like this exist already and it could be an extension of what Europeana does. If it was a physical repository for the items it would be more like Wikipedia Commons. It could be a set of policies or guidelines to which content contributors could subscribe that vouches for certain beliefs and practices, perhaps including the badge above. It could be a concept for policy makers to get hold of, a flag to rally around. But even then you’d think it probably needs something more concrete to talk about otherwise no-one will know what to do with the idea. And if it’s not concrete it can’t be measured, which will be important for many people. What this does have in its favour is that it may be vague enough for a wider range of organisations to subscribe to it. If the BBC or Supraphon or Lionhead Games wanted to be a part of this sort of commons, perhaps it could be vague enough to enable it. It would be a commons with a small “c”, perhaps: simply an expression of the shared culture(s) of Europe, with no warranty implied about the nature of the content or how people might use it to “participate” – the ability to use (consume) alone might be enough, not to reuse or repurpose. Charlotte Hess: what makes a new commons different? On Wednesday my great uncle Raoul died, a couple of months shy of his hundredth birthday. It wasn't unexpected really, but still sad. Though I didn't see him nearly enough, he was a lovely man and really unlike anyone else I've met, yet at the same time he evoked many of the feelings and sense of mental orientation common to the eastern European Jewish branch of my family. 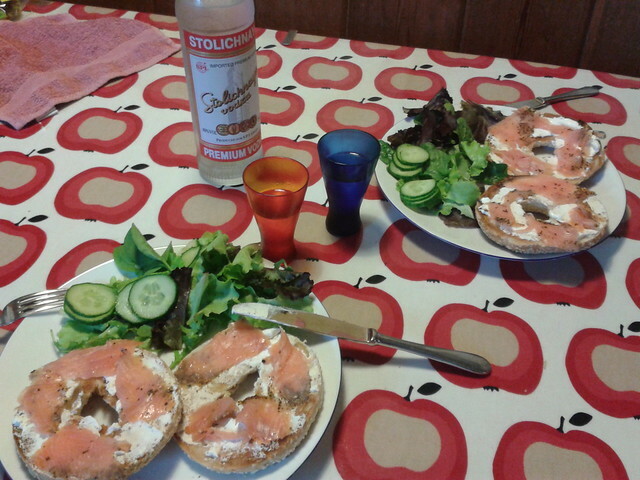 That evening at Fiona's suggestion we had vodka and smoked salmon for dinner, the perfect way to toast Raoul's passing. The next morning I scrawled some thoughts as they fell out of my head on the train to work. Here they are pretty much unaltered, errors and all (but small clarifications follow). It was a hollow day when that last thread was cut, but it ended with salmon and chilled vodka in icy glasses and reminiscence and warm thoughts. The last of a generation was the least of what Raoul was, but he was that for our family too, and losing him is losing all those already missing, a little more. But it’s Raoul we’re missing now. Of course, I never knew the baby born in Samara or whatever that far off city was, or the little boy fled to or through Odessa with his family when the Russian revolution came. I never knew Raoul in Czechoslovakia or later in Estonia or Latvia or whichever Baltic enclave where he worked in... was it some printing trade? I never knew the Raoul my aunt Grete knew, who met and married him; I’m vague even on the how or the when. The Raoul who came pre-war to London on business dealings for his father, who by myth or legend seems to have had a slightly roguish, edgy existence, but later became a restaurateur, businessman, landlord, investor; I was no peer or pal of his either. My history is hazy, and I could easily clear it up but it doesn’t seem to matter in a way, except for the pleasure of the tales. I knew – I loved – but a small corner of the man. I knew him as a child knows an adult, perhaps even in adulthood myself. But his long history, all of it, was marbled through him, salted and spiced him, was bound into his manner, his good humoured warmth and generosity. It peppered his parlance and points of reference and if I only heard him talk (hilariously) of his early years in his very late years, I’d felt it long, long before. Because Raoul, to me, was the man I knew as a little kid, part of Grete and Raoul with their sidekick Misty, who would roll in with their Peugeot saloon and often as not with Tic Tac Granny to our house in St Margarets, or who we’d visit in Ladbrooke Grove. He was the big hairy hand, those particular fingers, the complicit pat on the wrist and later, very hard of hearing, the waving away of some missed part of a conversation because he knew it only really mattered that we were sharing time. Too little of it, of course, and I wish more than anything that my kids had seen enough of him to know him a little, and vice versa. But I know how he cared for them regardless. I can hear his voice now, not saying anything, I just hear the tone, the syllables and prosody and that same layered and weathered, weathered and layered person, complete just in that sound. I wish I could really, really hear it.